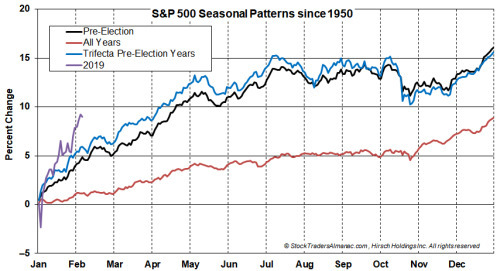 From recent posts and the 2019 Stock Trader’s Almanac we know that pre-election years have historically been the best year of the four-year-presidential cycle and a positive January Trifecta has also been historically bullish for the market. The impact of a positive January Trifecta in pre-election is not as powerful as other years of the cycle because pre-election years are typically quite positive however, the Trifecta does raise the ceiling. 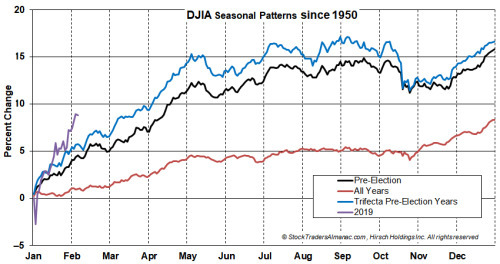 In the following chart of DJIA(NYSEARCA:DIA), S&P 500(NYSEARCA:SPY) and NASDAQ(NYSEARCA:QQQ), the one-year seasonal patterns for “All Years,” “Pre-Election Years,” “Trifecta Pre-Election Years” and 2019 have been plotted. 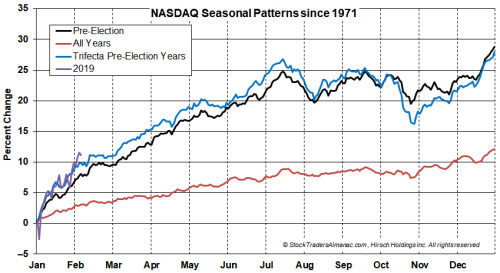 Declines in October are the result of the crash in 1987.